In what I consider the worst signage arrangement in the world, is on the US-78/I-22 transition south of the Mississippi/Tennessee state line. I get that I-22 is not a route in and of itself, and is merely an overlay on top of US-78. But the signage coming south out of Memphis is horrific. No mention of I-22 on "any" signage or continuation signage. The signs for the new I-269 just say "Collierville" for the A and B routes. A and B are reversed on the sign, probably because the control city (Collierville) is the only one listed. What about Tunica or Hernando? Hello? I just left TN, and the only control city you can put on is back in TN? Wouldn't a continuation sign be right next to the Collierville I-269 overhead exit notice showing "I-22 Birmingham" and "Ahead" as the next control city? 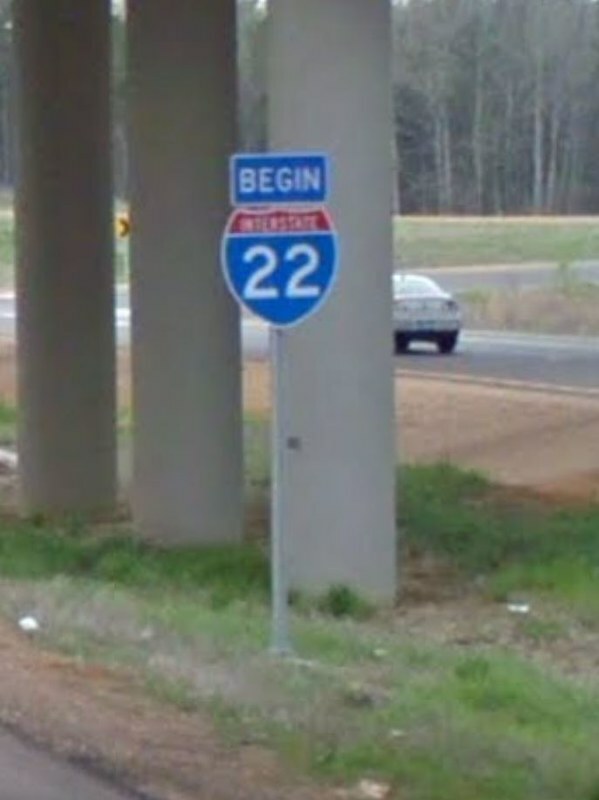 The first sign that I-22 even exists is actually after Exit 14 (MS-309) on the post merge ramp signage (co-signed with US-78) at mile marker 15. In my travels that has to rank as the most laziest sign arrangement I think I have ever seen. Not even a "Begin I-22" exists. Reportedly AASHTO gave the green light to sign I-22 back in 2015! Here we are 3 years later and its almost a reluctant activity. Someone at MSDOT must really be a psycho. If I didn't know better, it's almost a passive aggressive act that this road exists and was built to benefit someone else (Memphis) and its not Mississippi. Therefore we will sign it that way, nuts too you. I went back and looked on Google and found this....under the bridge. Must have missed it. Lots of photos of I-22 signage over in the Interstate 22 thread in Southeast, including the WB "END" shield assembly across the freeway from the one pictured above. While often mounted alone, there's plenty of I-22 reassurance shields in both states -- just no trailblazers in TN (so far) or any presently on I-20 or I-59 in Birmingham directing traffic up I-65 to I-22. I'm really trying to understand the frustration in the original post. "The signage coming out of Memphis is horrific" because TennDOT has absolutely not interest in committing themselves in any way, shape, form, or fashion to anything related to I-22 on Lamar Avenue (US 78). They've been clear about that. It's also inaccurate to say, "(t)he first sign that I-22 even exists is actually after Exit 14." Pull-through signs on EB US 78 indicate I-22 as well using Holly Springs and Tupelo as the control cities. The first ground mounted sign is an I-22/US-78 sign immediately after the EB C/D lanes join the main lanes. If this is, in fact, "the most laziest (sic) sign arrangement" you've ever seen in your travels, get on the road, my friend. Clearly, you've never been to New Mexico. Perhaps I had too much hyperbole (or coffee) in the post. Just inadequate signage for I-22 coming out of Memphis and I will leave it at that. I have driven New Mexico. I have driven 49 of the 50. And while I have been in Alaska, I wasn't required to drive at the time. Driven in Ireland, South Africa as well just to name a couple of other places. At least lack of signage in Ireland was consistent throughout. Signage, as well as pavement smoothness, has improved slightly under the Martinez Administration. Several highly apparent errors on signs on Interstate routes (25 & 40) have quietly been "fixed" in the last 6 - 8 years. Alas, they (nmdot) still hold fast to Pete Rahn's "Practical Design", and fail to design and build correctly. State Rank - Aprox #40. Mississippi, with it's aggressive four lane programs, with many built to Interstate standards, ranks far higher. Mississippi, with it's aggressive four lane programs, with many built to Interstate standards, ranks far higher. Having been stationed in Mississippi twice, including during the peak of their 4-laning program, I would disagree with this. Very few of their 4-lane program highways were built with Interstate-grade shoulders. The only notable exceptions were the then-remaining segments of US 78 and the Columbus & Starkville bypasses on US 82...those were built with shoulders. But other 4-lane program roads like US 45, US 82 (west of Starkville), and US 84 lack paved shoulders, even on the freeway segments. New Mexico's NM44/US 550, US 70 Hondo Valley, and now US 491 are all horrible. No median separation, only a painted stripe, no real improvement of horizontal and vertical curves. Add increased speeds, and one gets increased fatalities due to cross over incidents. Gary Johnson and Pete Rahn have blood on their hands. The only stretches of US 491 that are horrible is north of Shiprock to the CO stateline (with the remainder of the highway to Cortez needing to become a divided highway as well, in a perfect world) and as you come into Gallup where a controlled-access bypass would be ideal. Even these stretches being "horrible" is debatable, and so US 491 is 4 lanes divided from Shiprock down to Gallup now and is sure a lot better than US 70 in the Hondo Valley and US 550 south of Aztec. US 72 and also US 49 also have unpaved shoulders. US 78 also had unpaved shoulders until I-22 came along. The pre-four-lane-program segments of US 78 were the ones with narrow shoulders. Mississippi included funding in their four-lane-program to complete US 78 in the state instead of completely relying on Federal AHDS funds as Alabama did...which is in no small part why US 78 in Mississippi has been completed for almost 25 years and it just got finished in Alabama within the past year. The four-lane-program segment of 78 (generally Holly Springs to New Albany) included full shoulders.